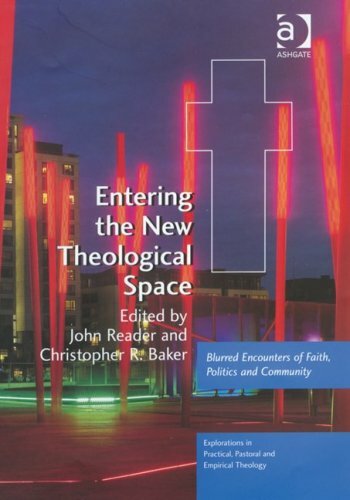 John Reader and Christopher R. Baker, eds, Entering the New Theological Space: Blurred Encounters of Faith, Politics and Community. Explorations in Practical, Pastoral and Empirical Theology (Farnham/Burlington: Ashgate, 2009), pp. xiii + 241, £55.00, ISBN 978-0-7546-6339-3. Nicholas Lash, in his book Holiness, Speech and Silence: Reflections on the Question of God, gives voice to the difficulty of thinking Christianly in ‘a culture whose imagination, whose ways of “seeing” the world and everything there is to see, are increasingly unschooled by Christianity and, to a considerable and deepening extent, quite hostile to it’. He notes the serious and dangerous demands posed in such a situation by continuing to hold the Gospel’s truth rather than paying mere lip-service to ‘undigested information’ (p. 4). Believing that the time has come to help missiological communities to engage and digest in the linear spaces opened up between post-Christendom politics and interfaith actualities, institutional monads and inter-organisational networks, rural and urban spaces, the status of paid and unpaid, and the contested and evolving relationship between faith and science, for example, the contributors to Entering the New Theological Space seek, in different ways, to map such space ‘by means of a triangulation between narrative, praxis and theory’, to ‘offer some idea of the complexity and interdisciplinarity associated with this new space’ – a so-called ‘third space’, the ‘space of the both/and’ (p. 5), a more fluid space which discards the oft-maintained binarism of the either/or space – and to assist readers to analyse the significance of such ‘blurred encounters’ which, the editors believe, are ‘forcing the church to develop increasingly fluid and experimental forms’ (p. 10). Each of the fifteen essays in this volume are in their own way stimulating, and most are well-researched and eruditely penned. They cover a range of topics, from John Atherton’s ethical-economical-theological reflection on a ‘pilgrimage’ down Edinburgh’s Royal Mile to explore places where ‘inevitable and potentially creative’ (p. 25) ‘“edges” have become mainstream’ (p. 19), to Malcolm Brown’s essay on the ‘social atomisation’ and ‘rootlessness’ (p. 70) of London’s suburbs, to Margaret Goodall’s exploration of human personhood in a thought-provoking essay on dementia, to Clare McBeath’s piece which asks whether a community or a city can be said to ‘suffer from mental illness’ (p. 147), to Philip Wagstaff’s reflection on the fluidity and stability of rural ministry. Two essays merit special mention: Martyn Percy’s considers the nature of the cultural dynamics, implicit theology and ‘invisible religion’ (p. 179; the phrase is Thomas Luckmann’s) that continue to birth requests for baptism (or ‘christening’) of children from non-churched families. He writes concerning the ‘deeply coded ways in which people talk and act about God’, that ‘religious language is carried in the emotion, timbre and cadence of worship’ and that ‘deeply coded language is not [necessarily] a strategy for avoiding explicit theological language’ (p. 184). Percy’s attempt to sketch a theology of cultural conversation, and to explore some implications of such conversations for missional and risky engagement in the ‘areas of overlap and hinterlands between the life of the church and the world’ (p. 179) merits further thought. Drawing upon the work of Bruno Latour and Slavoj Žižek, and bringing their thought into conversation with events surrounding the 2007 outbreak (in Surrey) of foot and mouth disease, John Reader contributes an intriguing, if somewhat undercooked, essay on the nature, possibility and linguistic challenges posed to truth speech by the mutual encounter of science and theology. He concludes by stating that it is ‘only by keeping the insights and theories of both faith and science in circulation’ that we can be ‘certain of remaining “in the truth”‘, and that it is ‘only by loading into the process that contact with the wider world’ that we ‘avoid an unhealthy closure of questioning and debate’ (p. 208). Some reservations: the noticeable absence in this volume of any discussion on the significance and place of technology (blogging, social media and gaming, for example) in theological and ecclesial discourse and praxis, and vice-versa, represents a disappointing gap. Also, there is in this volume a significant number of typological, grammatical and factual errors (John Knox, for example, was not the ‘first Presbyterian minister of St Giles and Scotland’ (p. 20)), errors which one expects would be corrected before print and to be rare in a book wearing such an inflated price tag. Finally, while one may well concur that ‘all the essays in this book are a testament to the ongoing adaptability and robust mutuality of Christian thought and the church’ (p. 7), if this volume represents ‘the new theological space’ then one might be forgiven for observing that, with one or two exceptions, such space is a little light on the theology front. These reservations aside, not a few of the essays in this volume deserve wide reading, and the ongoing conversations encouraged therein are to be commended. Social planners, missiologists, pastoral practitioners and those training them will all benefit from reading this book, and from taking up the challenge to engage in the interdisciplinary and multilayered interstices of cultural, political and theological realities. Thanks for the very helpful review Jason. I have hesitated at purchasing it, and still am, but one or two comments you’ve made make me think it more worthwhile. Yes thanks for going ahead of us on this one Jason. Your comments provoke some thought even if I don’t purchase the book. One of the things I find most obviously absent from theological writings of the day and the recent century is the lack of awareness of the intellectual subtlety of Holy Scripture. It troubles me that the usual approaches to the Bible reflect the same mind set that the Book is the product of primitive outlooks and accordingly reflects such puerile understandings and perspective. Some 40 years ago I began to look at the Sacred Writ as inspired by Omniscience and therefore to look at it as reflective of the effect of a profundity commensurate with such a source and cause. Immediately, I began to be aware of the intellectual depths and the rigor of crystal thought implicit in simplicity, the depth of which awed my mind. The challenge of a Divine Author is that of subtlety which one is hard pressed to become sensitive to, and aware of, in order to grasp. The contructs in simple language virtually require sophisticated insights and perspectives for a ready understanding. Interestingly enough, Ifound the ideas, two-sided and apparently contradictory, were designed to produce a tension in the mind of a believer which enable him to meet reality in and of this world as exigencies arise. In other words, the make the believer balanced, flexible, creative and magnetic, in short, wholesomely and attractively mature. This isn’t related directly to your post (sorry), but I just wanted to say thanks for writing this blog! You don’t know me, but I always appreciate it. Peace to you.